12375 CCT007.jpg 500X638\CCT007.jpg 12376 CCT007_1.jpg 500X638\CCT007_1.jpg 12377 CCT007_3.jpg 500X638\CCT007_3.jpg Send A Hint! Product Description: less text Say "I'm sorry" in the best way possible - with cookies! 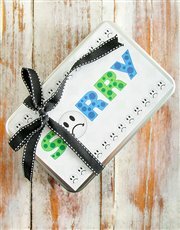 This Sorry Cookie Tin is the perfect way to turn someone's frown upside down. Made up of 8 beautifully decorated vanilla cookies in a keepsake tin, you can rest assured that your loved one's day will be instantly brighter when this yummy treat arrives at their front door! Send this sweet gift with The Bakery at NetFlorist today! Allergens: wheat, gluten, cow's milk, egg and dairy! All our products are Halaal. Get this Sorry Cookie Tin delivered with NetFlorist.